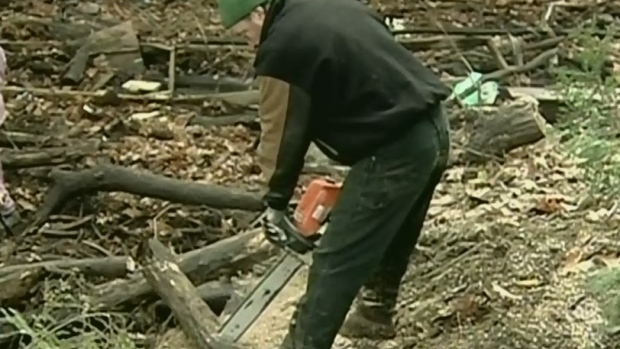 A group of property owners and volunteers rolled up their sleeves to remove a pile of logs that was blocking a river. The group of around 20 people are hoping that by removing the logs, it will help prevent rising water levels and spring flooding of the Black River in Ramara Township near Washago. The group believes the log jam may have contributed to the flooding of more than 100 properties when the river backed-up into Lake St. John. “We’re just trying keep things lower so we don’t have two or three feet of water in our backyards,” said property owner Tim Hand. Outgoing Mayor Bill Duffy had a lawsuit ready against the Ministry of Natural Resources, who are responsible for maintenance, and local property owners for flood damage costs, but he withdrew the lawsuit after property owners volunteered to remove the log jam.